Why did Jesus fly into the sky? 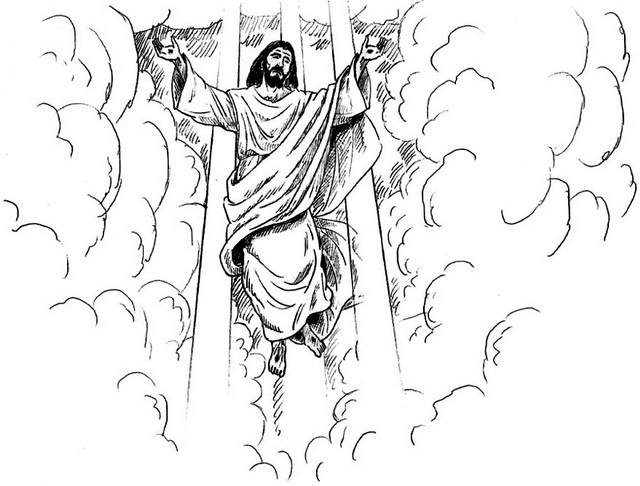 When Jesus ascended into the sky from earth, what happened to his physical body? I know he had a physical body at that point because he let people touch him. At 30k feet or so there isn’t enough oxygen to survive and it’s freezing. So, would he have disconnected his spirit from his body? And then would his body fall back to earth or burn up in the atmosphere? I asked a Christian this question and he said at that point Jesus had “a glorified body” similar to the ones we will get when we go to heaven. So since the Bible does explicitly state that “he was taken up into a cloud” and the only way that could happen was with a super body, let’s assume that’s the case. When Jesus ascended into the sky, where did he go? Obviously heaven right? So then where’s heaven? Is it above our sky? According to the Acts passage, it is apparently in the sky or our sky can open up a window to see it. But what if heaven is outside space and time or in another dimension as some Christians claim? The Bible doesn’t seem to address this as far as I’m aware and in fact seems to say that heaven is above the sky but let’s assume it’s outside our known universe. Why bother dragging a physical body from earth to heaven? After all, aren’t we told that when we die, we just pop into heaven or hell as a soul? I would have thought Jesus would have said “I’m going to heaven now” and then his body would crumple to the ground (same as us – supposedly). So let’s assume he had a good reason to drag his physical body up from earth into the sky/universe/other dimension/heaven. Why the heck would he want to? Before coming to earth, I’m assuming he was some kind of ethereal being unconstrained by any physical bounds. The only reason he had a body at all was the process of being born on earth. And clearly it’s now glorified but still scarred with holes in it and only 5-6 feet tall most likely. Seems awfully limiting. I consider myself a logical person. At least I try to be logical. Sometimes my humanity gets in the way of my logic but I try. I consider myself a skeptic. I believe to question is to be wise. To not take things at face value is a virtue. I teach my kids to avoid automatically believing what people (even I) say. I teach them to investigate for themselves to try to find the truth. Until my deconversion, I was a deist. At the time I wasn’t aware of that term. I had already dismissed the Bible as historically inaccurate when it came to stories like the creation account or Jonah and the whale (big fish). I thought we lived in an old universe and laughed at believers who thought the earth was 6,000 years old. But I thought most of the historical accounts were mostly accurate. I certainly thought a man named Jesus walked the earth. About a year ago, I got interested in investigating the claims of the Bible. It turned out to be an extremely fascinating (and actually quite fun) but most of all shocking. I had no idea just how historically inaccurate the Bible is. Since my discoveries, I’ve been running around telling people about them. I was naïve in that I thought people would be interested in the shocking findings but forgot that many had strong foundations in their lives and those people didn’t want to hear any of it (as interesting as it was). Now I realize it was easier for me to digest because I wasn’t very invested in religion at this point of my life. I had already stopped going to church mostly because I thought it was boring. Today, as a direct consequence of my studies, I’m an atheist. I don’t know who/what/nature sparked the universe and life into existence and I am amazed we are here. But I know beyond all doubt that Yahweh (the god of the Bible) is just another mythological character. I have no confidence that humans to date have discovered who God is if it exists. I’m even curious whether the god concept makes any sense in the universe. So now that I know where I stand, I am going to have some fun detailing the ridiculous logical knots you have to twist your mind into to believe the Bible and/or the Christian doctrine. In some cases I will be taking the approach where I assume the Bible is true and show how ridiculous it is if so. I hope readers will enjoy the ride. I plan on treading new ground I haven’t seen tread by other atheists. PS – The title of the blog is intended to poke fun at Ray Comfort. His video “Evolution vs God” is one of the most ridiculous pieces of anti-evolution propaganda I’ve seen. Also, God here means the Christian god (aka Yahweh).